Hey! You! Get onto my cloud. 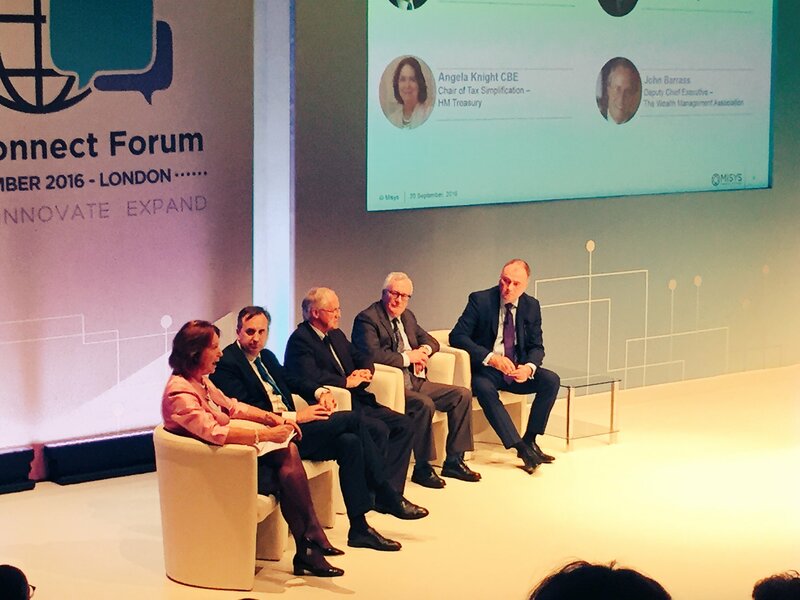 This was the main message from the Misys Connect Forum in London as the vendor held a one-day conference of panel debates, Q&As, presentations and demos. At yesterday’s (20 September) event – “the largest Misys conference ever” with 600 attendees – at The Mermaid in Blackfriars, the morning began with a press conference and the unveiling of Misys’ new Platform-as-a-Service (PaaS) strategy, FusionFabric.cloud. This will enable “third parties to develop, deploy and operate financial services apps in the cloud”. After this, the main presentation on the theatre’s stage saw Tim Goodhind, MD, northern Europe, Misys, not indulging in amateur dramatics or Greek tragedy, but explaining “I haven’t met a client not interested in the cloud”. Misys’ message was that it’s betting big on cloud – because it says all its core solutions will run there by 2017. This theme, along with transformation and digitalisation, dominated the panel discussions. Compared to other events of this nature, Misys offered a lot more interaction via polls. This kept the audience engaged, but Misys may also be doing it to see what the delegates want so it can work out its next sales strategies. The results of the polls are worth mentioning. During a discussion on “digitalisation for dynamic retail banking”, 28% of the audience said the biggest digitalisation challenge was “delivering integrated customer experience”. In a corporate banking chat, 67% of the audience said the biggest challenge to meet client needs between operations and finance is “legacy systems and silos”. While for the lending discussion, the audience spoke again – with 43% saying regulations are the biggest driver for change in their lending business. And the ubiquitous blockchain also got a mention near the end of the day – 56% of the audience revealed they have a blockchain project at their institution. Wherever we are in the world, we cannot escape talking about blockchain. It was not all heavy tech talk. Elsewhere, a fast-talking debate looked at whether Brexit could positively impact UK finserv. The eminent panel of four (two had CBEs) was unbalanced in favour of Brexit, but articulate and entertaining. Three of the four hogged the show with their undiluted adoration for Brexit. They thought it was the best thing since sliced bread. Arguments for a Brexit boon varied from “free trade and deregulation being good for the City [London]” to the UK’s advantages of “ecosystem and geography”. The lone voice against Brexit warned that the deregulation period “will be concerning” and if people think regulations outside of the EU will be light, they need to think again. He cited the FCA as an example with its regulations. When the audience were asked if Brexit will have a positive impact on UK finserv – 25% said yes; 34% said no; and 30% said it’s too early to say. A lot of the panel discussions raised some fairly good points, but in the interests of (your) time will not be related in full. During a discussion on banking in the “fast lane” – Joao Fonseca from Deloitte felt that banks innovate to avoid being dinosaurs, because they have to do it. But there’s no passion. Fonseca also said CEOs are perhaps too old and just “not getting digitalisation”. You could argue that once a CEO is too old, they need to get out to ensure innovation is maintained. Almost like a less sinister version of ‘Logan’s Run’. But the star of the show was distinctly non-human. 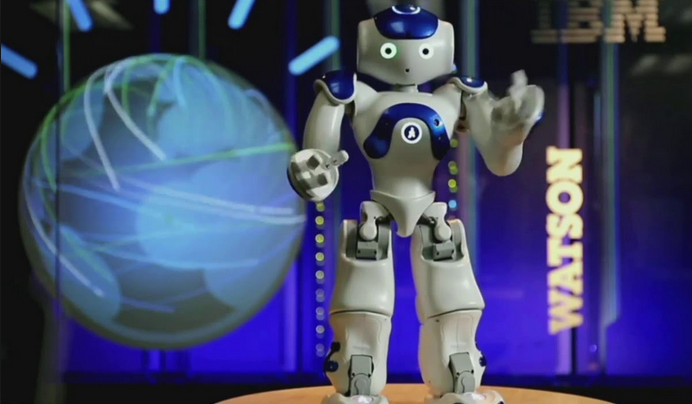 IBM’s diminutive robot, Noah, charmed the audience with its voice, size and comments. The latter involved Noah asking the audience to sit closer and “don’t be shy” when asking questions. David Robson, director for IBM’s Watson Financial Services Europe, did a demo and asked Noah questions on mortgages. The robot responded well as it is connected to the cloud where all the intelligence is located. Noah’s star turn had a point as Misys uses IBM Watson in seven different countries and clearly wants to demonstrate its use of new tech in finserv. Misys’ event went well with a lot crammed into one day. The firm used guile in its sales pitches as nothing was overt or oversold. The panel discussions were a chance to talk with relative freedom and Misys’ representatives during these chats only briefly used them to promote their products. The closing remarks from Misys’ Goodhind were mercifully brief and in a clever use of time he answered direct and specific questions from the audience on its products and strategy. It was this extensive use of interaction by Misys that was all the difference compared to similar fintech events this year. Investors include Melinda Gates’ Pivotal Ventures. The conversational AI is called Olivia.